This site is about the 1964 Allied Seabreeze yawl hull #16, previously named Perelandra but now tentatively renamed Pixie. 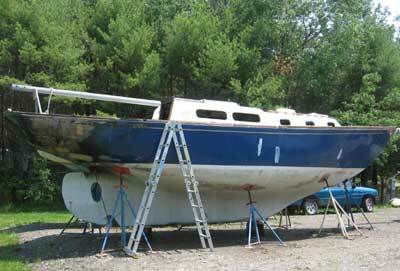 In 2004, I bought the boat for salvage value after she was involved in a gasoline fire in late 2002. The hull was somewhat damaged in the stern quarters, but most of the fire-related damage was from smoke and water. Clearly, there was a lot of work to be done, but I saw challenge and opportunity, not destruction. We bought Pixie as a long-term reconstruction project. The time frame was never defined beyond a loose 5-10 year deadline, but shortly after making the decision to purchase the boat, my wife and I threw a wrench into the works: we purchased some acreage, and spent the next two years building a new shop and home on the property. This project and move, which hadn't even been under consideration when we decided to purchase Pixie, consumed our resources and time from 2005 through the present day, and the Pixie project has unfortunately suffered and been shoved to the back burner for now. Although the boat was indoors for more than a year after the new shop was built, the house construction and a growing business prevented me from getting any work done on the boat, complicated further by the financial burden of the new house and shop project. Eventually, I decided that she needed to move outdoors until the time truly came to get to work. The time will come for Pixie. For now, she's stored under cover and outdoors, awaiting her turn. The project is not forgotten--simply postponed in the greater scheme. Site Design & Content ©2004-2008 by Timothy C. Lackey. All Rights Reserved.